Sprint has slashed issue resolution time – on website errors, retail outages, and sales and marketing requests – from hours or days to minutes or even seconds. From day one, minute one, the Elastic Stack delivered stable performance and immediate value – Sprint expects project payoff in under six months. 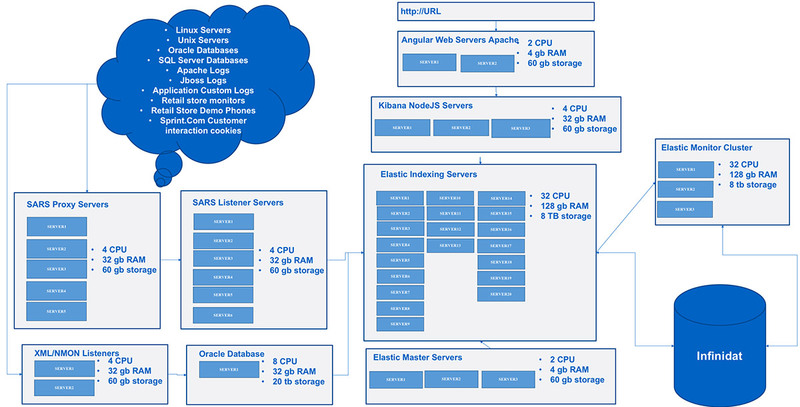 The Elastic Stack aggregates real-time data from Retail Management and Store Operations applications and hundreds of APIs running on thousands of servers. 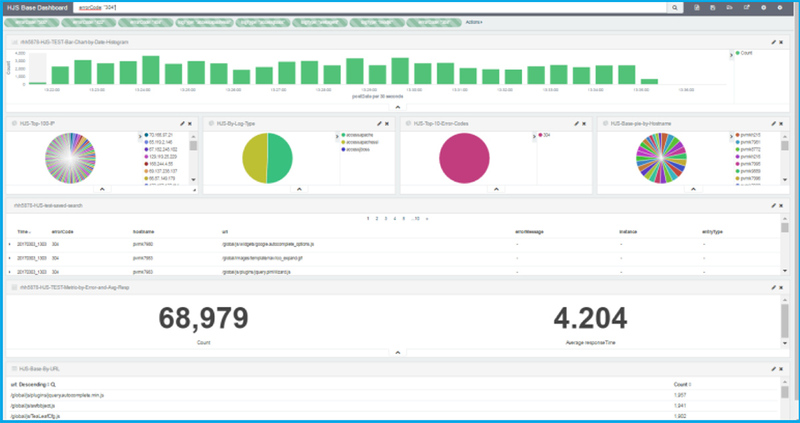 200 dashboards represent 3 billion events per day from logs, databases, emails, syslogs, test messages, and internal and vendor application APIs. With 30,000 employees around the globe and over 1,800 retail stores, Sprint serves approximately 60 million connections. At the core of the business are a plethora of applications that power a range of operations, from customer support to provisioning and selling phones. These applications generate vast amounts of data — Sprint ingests almost 3B records per day and stores 50TB in real-time — which was previously isolated from the business. Through its Digital Transformation 4.0 Project, Sprint has unlocked this data. The Elastic Stack (Elasticsearch, Kibana, Beats, and Logstash) serves as the backbone of the project, enabling Sprint to leverage its data for competitive advantage. With the Elastic Stack, Sprint has "lifted the veil" of IT. For the first time, business units and executives have insight into metrics like sell-through and sales performance, and they now understand how application performance impacts the company and its customers. What used to be a technical discussion is now a business discussion. Communications services giant Sprint (NYSE: S) strives to create more and better ways to connect its customers to the things they care about most. Widely recognized for developing, engineering, and deploying new technologies, including the first wireless 4G service from a national carrier in the U.S. and a global Tier 1 Internet backbone, its commitment to innovation runs deep — all the way down to its data. Sprint knew that improving their standing in this highly competitive industry hinged on unlocking data from silos. The Elastic Stack made that innovation possible. Today, the Elastic Stack enables the company to ingest, search, analyze and visualize real-time data from any source, in any format, and share it instantaneously to drive key business decisions. With insight into sales, outages and how customers are using products, business units, IT and executives are all better able to monitor company performance and make strategic decisions quickly. Sprint has improved customer service and slashed issue resolution time — on everything from website errors and retail outages to sales and marketing requests — from hours or days to minutes or even seconds. They've also increased sales, with new phone sell-through via Sprint.com climbing rapidly. Exploring the Elastic Stack started as a side project for a couple employees, but quickly evolved into one of Sprint's most strategic initiatives. Stefan Stroebel, Technology Architect and mastermind of the Elastic implementation, and John Felton, VP of Enterprise Services, are the two leaders on the Sprint IT team who not only had a vision, but built the solution to innovate. Starting with a small proof of concept for one of Sprint's retail management systems in 2015, they were blown away by how much they could see. Stroebel remembers the excitement that "wow — we can see everything… everything!" They started by putting the Elastic Stack through the development process and a short time later, had it live on two servers within 48 hours of starting the production migration processes. Today, the excitement persists as a dedicated team continues to implement innovative use cases that are driving meaningful change for the company. "Enterprises sometimes don't have the right mix of teams, which can hinder a project like this," said Chief Strategist Sreedhar Busanelli, who, like the rest of the team has a keen understanding of development, operations, as well as the business. "Our team has the right mix. That's why we've been able to bring so much value so quickly." Along with IT, business leaders across the company are excited about thinking far outside of the typical IT box, and that's paying off. Performance of core online and retail systems are directly connected to new subscriber acquisition and retention. Yet in the past, data silos prevented Sprint from being able to connect the dots and make changes quickly to drive results. When the team implemented the Elastic Stack with existing legacy systems and applications, they were able to burst through those silos to create a single platform for searching, analyzing and visualizing data in real time. Immediately, they knew all the critical operational metrics — How are APIs performing? What are response times? And within a month, they were fully operational, with insight into data to accelerate IT troubleshooting and help the business understand performance metrics to proactively support customer satisfaction and drive sales growth. They made good on the vision to establish the Elastic Stack "like electricity" — just turn it on and it's there. Real-time visibility into the business is vital to competitive advantage. Sprint is now able to educate and motivate its 30,000 employees with insight into how the company is performing on any given day. Everyone from executives to account reps to retail store employees are rallied around common growth goals and have gained the gift of speed — the ability to identify issues and make changes more quickly than ever before. Tools like the Elastic Stack are making the difference for the company and for the consumers...We don't need to roll out a secret plan to gain an edge over the competition. Being able to see problems in the system and take care of them in seconds instead of hours or days is a huge advantage. On Black Friday 2016, Sprint experienced a significant decrease in web response at Sprint.com. Previously, it would have taken hours to manually hunt through the data to identify the root cause and fix it. Instead, the IT team was alerted immediately, identified the issue, and quickly corrected it. That kind of speed is critical to delivering premium customer service and selling more phones. Sprint IT can now proactively address outages, accelerating issue resolution to minutes or seconds in many cases. They can immediately identify problems and proactively address warning areas before they flare up into an outage. With online and retail stores so closely connected to sales performance, minimizing network outage time is critical to preventing irreversible damage to sales numbers. Sprint has also improved uptime of retail store systems, getting a sales application back online after a crash almost instantaneously, instead of hours later. "The retail employees were amazed," said Busanelli. "We went from not knowing what's happening to calling proactively. Plus, we discovered a dozen major root causes in the system that weren't evident before." The Elastic Stack, along with Elastic's X-Pack commercial extensions for security, monitoring, alerting, reporting and Graph, enable Sprint to make structured and unstructured data usable for the business. Sprint uses the Elastic Stack to aggregate real-time metrics and data from the company's Retail Management and Store Operations applications and hundreds of APIs running on thousands of servers. That data shown in more than 200 dashboards represents 3 billion events per day from logs, databases, emails, syslogs, test messages, and internal and vendor application APIs. "What Google did for the Internet, the Elastic Stack does for Sprint's machine data," said Stroebel. With the Elastic Stack, Sprint can search 38B unique production documents in under a second. In some instances, as many as 100,000 documents are indexed every second. The ultimate objective for Sprint is to see how the company is performing on any given day, especially around sales. Take the sales dashboard with heat map that hangs from the CEO's wall, for example. Before, IT relied on enterprise-level data warehousing tools (which are by definition 24 hours behind), to determine if there was a drop in sales. This required a lengthy process of massaging the data, putting it into the right tables, and correlating it with business metrics. What used to take 36 hours is now available in mere seconds. Any employee — with different controls on data viewing — can see real-time sales volumes and trends, including percentage increase (changes to green) or decrease (changes to red) of phones sold. And in an upcoming project enhancement, Sprint plans to provide customer activity volume segmented by store and employee staffing targets. The Sprint National Retail team is now able to easily track sell-through drivers and metrics for its store operations in real time: What's a store's network latency? What's the average search response time in milliseconds? How many customers are connected to Wi-Fi? How many units is it selling, and which are selling better than others? Sprint also monitors the usage of its demo model handsets every 15 minutes to understand how devices are being used by customers and to identify any connectivity issues that directly impact sell-through. Another example comes from the Wholesale Sales team, which aggregates data (including production logs and activity levels across applications) to simplify management of hundreds of B2B relationships, all with varying contracts, activation volumes and service levels. Previously, it could take four to five days and intervention from the Sprint IT team to resolve a problem. Now, B2B partners have self-service tools to resolve issues in minutes — so they can get back to focusing on their core job rather than worrying about the root of a technical error. The Elastic Stack has also helped Sprint improve customer satisfaction. Recent corporate initiatives have focused on the digitization of customer service — removing the friction in sales, marketing and support processes in order to deliver major cost savings and accelerate growth. Using the Elastic Stack, Sprint has been able to drive customers to its digital channels with new self-service apps that enable them to manage their accounts, purchase new handsets, equipment and accessories, and rapidly address any support issues. Sales and marketing dashboards track key sales and digital engagement figures in real time to identify aberrations in customer activity that may require immediate attention. In addition, when marketing shared its customer journey model, the IT department found out from pulling customers' online experiences that the actual journeys weren't matching the expected model. To service the customer better, Sprint redesigned the site and moved content. They would never have caught the discrepancies without Elasticsearch and Kibana. "We're a company where costs matter," said Felton. "The Elastic Stack is in the sweet spot, helping us deliver a lot of wonderful and innovative things in a cost effective way. Compared to the multi-million dollar investment of other systems, which can take months to implement and years to return value, the Elastic Stack delivered a stable implementation, with very little upfront risk and at a fraction of the cost, from day one, minute one." Sprint expects full payoff of the project in under six months. Compared to the multi-million dollar investment of other systems, which can take months to implement and years to return value, the Elastic Stack delivered a stable implementation, with very little upfront risk and at a fraction of the cost, from day one, minute one. While only a fraction of one percent of Sprint's annual IT budget, the Elastic Stack has led to a large increase in online sales — a ratio that the whole company can get behind. That huge jump resulted from Sprint's ability to identify web pages with the slowest response times and isolate bad customer pages to improve code. As page performance sped up, users stayed longer and completed more purchases. With the enhanced digital customer self-service tools, more customers have turned to Sprint.com to address their needs. After monitoring Sprint.com visits and sales during May 2016, the IT team was able to remove flaws in coding that caused pieces of the order process not to work. As a result, the customer completed a sale much more frequently, leading to a significant increase in the digitization of customer service on Sprint.com. The greatest thing about the Elastic Stack is that it's unbounded. You can do anything with it. Leveraging the Elastic Stack, Sprint has been able to launch new devices, products, service bundles and promotions more quickly — often days before competition — providing the company a critical competitive window. Busanelli agrees: "Trust me — we're going to push boundaries."